With Bonfire night out of the way and the first of the Christmas adverts now popping up on our tellies, there’s no escaping it. Whether you think it’s too early or not, Christmas really is on its way. The shop windows are becoming more festive, the shelves are filling up with novelty treats, and the school newsletters have gone out about the Christmas party. But what if you’re already struggling for present ideas for the new or expectant parent this Christmas? We know from our own experience that Christmas takes on a whole new meaning when you become a parent – especially if the little bundle is still shiny and new when the big day arrives. Gifting when a new baby arrives can be overwhelming. It also means that the new parents probably have everything they can think they could ever need. Expectant Mums are equally as tricky. They probably don’t want clothes until they are feeling more comfortable with their body shape. Booze is off the list, and although chocolates might help to fuel the night feeds, they won’t help when the healthy eating resolutions kick in. So what do you buy that will really be useful? Fear not! We have a few suggestions that we know they will love. This gorgeous gentle reed diffuser from Mummy Loves Organics scented with mandarin and frankincense encourages calm and sleep. Made with the purest essential oils, this delicate scent gently helps to develop a healthy and stable sleep pattern - vital in those last few weeks of pregnancy and for new mums. What’s more, it comes with a matching massage candle and pulse point oil too! The special edition of the Bibetta Ultrabib is the perfect thing to make everyone smile over Christmas dinner. Completely waterproof, washable and tumble-dry friendly, the cute reindeer design features the same award-winning soft pocket folds out to catch food - ideal for baby-led weaning and beyond. Designed using space technology, SpaceCot is a must-have for traveling with a young child. Comfortable, light to carry and simple to use, it opens and closes in under 3 seconds making it the ideal solution when traveling over the Christmas period or to use as a playpen. Safe, practical and stylish, the Nibbling range of premium teething necklaces, bracelets and toys, combines fashionable beautiful designs with ethical materials, to provide safe and practical solutions for parents and babies. 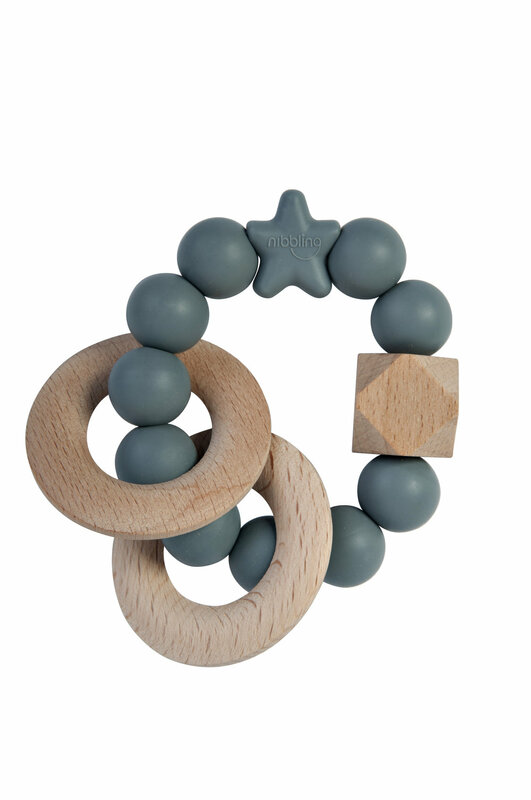 New for Winter 2017, the natural wood and silicone Rattle Ring Teether is perfect for the smallest of hands to hold - the distinct combination of textures is ideal for soothing baby’s gums, while the noise from the rattle provides a much-needed distraction to entertain little one. Available in seven colours, including limited edition pearl. Soft on babies gums and emerging teeth, this is a must-have piece for any stylish baby this Christmas.